For the best rates and potential huge discounts visit the Staybridge Suites Stratford City website and contact the staff directly. In addition, view the latest events and pictures on Facebook, Twitter and Instagram. 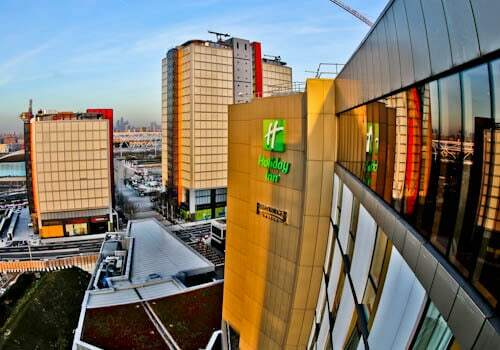 Staybridge Suites Stratford City is part a double decker hotel with the Holiday Inn. 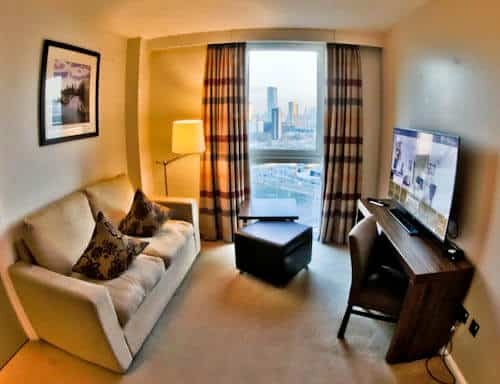 In fact, Staybridge Suites occupies the higher part of the building therefore you could argue they offer the best London views! To get a good idea of the location, you can clearly see the London Olympic Stadium from the balcony with central London in the distance. It’s a 5 minute walk to both the tube as well as the stadium. If you wish to visit central London it’s 5 stops away on the Central Line. Other popular destinations a short ride away include London Excel, Canary Wharf and the O2 Arena. 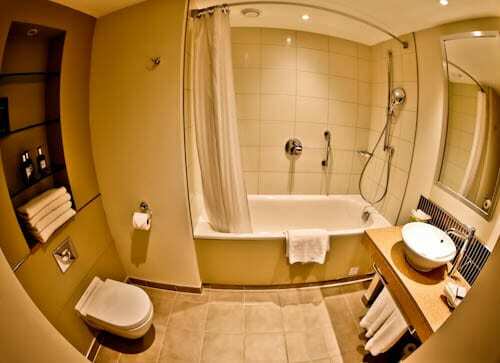 You’ll receive a home away from home feel as soon as you arrive at the Staybridge Suites. At check in, staff will explain the hotels facilities as well as any events which are happening during your stay. Take your time to view the painting behind reception. This is the tallest and longest tunnel slide in the world and you can see the real one through the window. Finally, adjacent to reception is the pantry where you can buy useful snacks, drinks and things to cook in your kitchen. The homely guest suite features all required amenities. Amenities include a fully equipped kitchen, flat screen TV, complimentary WiFi as well as a king size bed. In addition, you’re guaranteed inspirational views over the London landmarks. Various room types are available from a studio suite to a more spacious one bedroom suite. 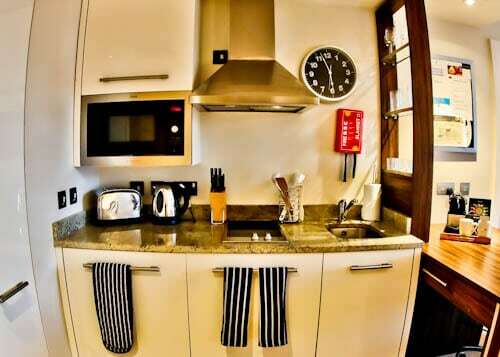 A fully equipped kitchen is a huge advantage when you visit London. Even more so, if you follow a strict diet. If you’re a vegan visiting London or follow a gluten free diet this kitchen will be your saviour. It will also be incredibly useful if you’re eating healthily and want to control your diet. 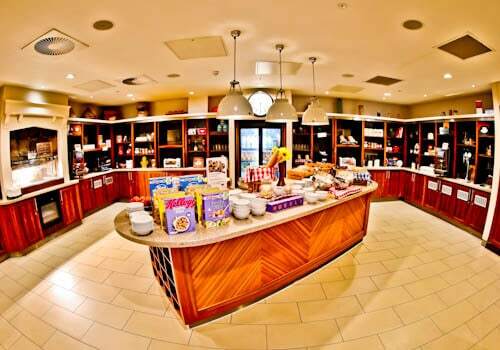 Lastly, the Staybridge Suites is in a huge shopping mall which features a supermarket. Alternatively, you can conveniently grab something to cook from the pantry adjacent to reception. One thing I love about the Staybridge Suites brand are the bathroom amenities. You don’t get a small bottle of shampoo or soap. As a matter of fact, there are large bottles which are replenished each day. Finally, a hot bath or shower is the perfect way to relax after a day in London. The buffet breakfast is unique in that it has the feel of eating breakfast at home. With the exception of course that you don’t have to cook or clean up afterwards! Do you want a cold fruit juice? Grab yourself one from the fridge. Which is your favorite breakfast cereal? They’re lined up in the buffet centerpiece. In addition, there’s hot food, fresh bread, fresh pastries and even a fresh pancake machine. 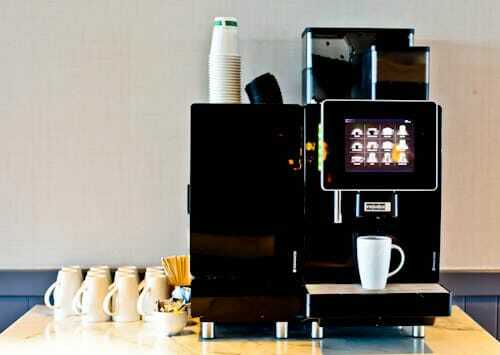 The tea and coffee machine is available not only at breakfast but also throughout the day and night. This is perfect for those who have a business meeting or even if you just require a boost before or after exploring London. What’s more, there are disposable cups available so you can take one before you leave. Guests are invited to social hour a few nights each week. 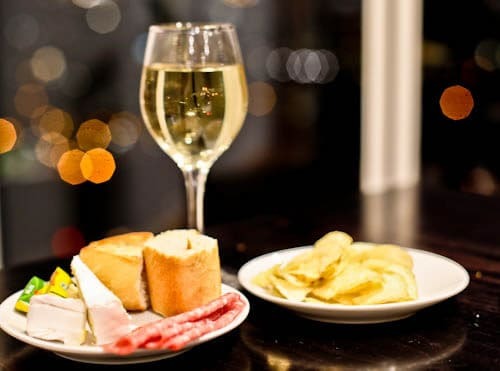 During social hour guests can enjoy complimentary drinks and snacks. Yes, that includes wine and beer. As a result, this may be the only hour when you’re not interested in the complimentary tea and coffee! 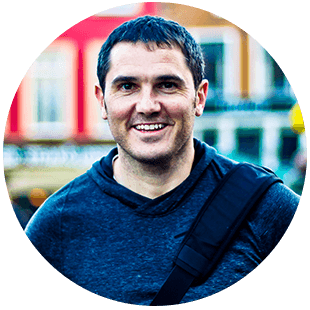 Not only is this a good time to meet other guests but also a good time to get to know the staff. This social hour really enhances the home away from home feel because the next day you’ll recognise so many faces. The Den is a private area which is perfect for small business meetings. 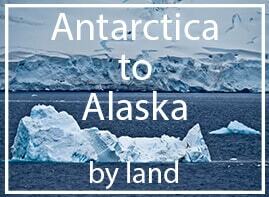 In fact, you can book this area in advance and it can be set up to your exact requirements. 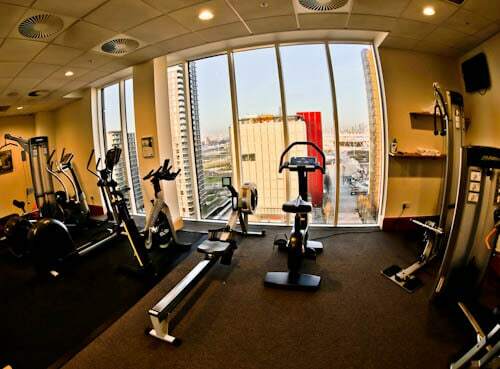 The onsite gym features several weight and cardio machines as well as dumbells. There is one thing this gym can offer which no other gym can. That’s inspiration. Out the window is the London Olympic stadium where so many greats won gold medals. Greats including Usain Bolt, Mo Farah, Greg Rutherford and Jessica Ennis competed here in 2012. Finally, on a pleasant day you may consider going for a run or walk around the Queen Elizabeth Olympic Park which surrounds the stadium. 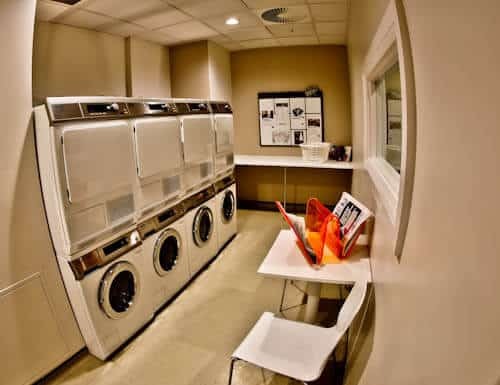 Guests at Staybridge Suites have complimentary access to a 24 hour laundry facility. For me, laundry is one of the most difficult parts of traveling. Even more so when you’re traveling long term. The complimentary laundry facility solves this problem for travelers. All you need to do is bring your laundry and detergent which is for sale beside reception in the Pantry. There are lockers available especially for long stay guests. For example, you’re staying in Stratford City for a couple of months but need to leave for a week. You may be heading north to Staybridge Suites Newcastle, or maybe to the Staybridge Suites Manchester. Alternatively, you could be returning home to visit family. You don’t need to take all your things with you. 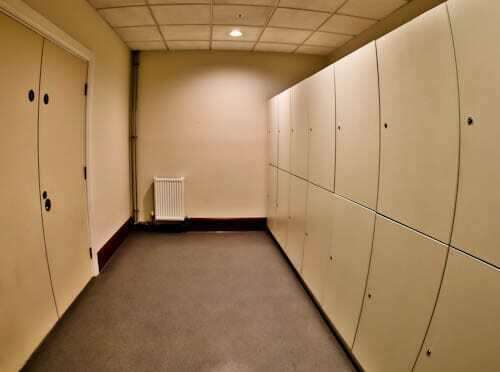 These spacious lockers are free to use and long term guest can securely leave their belongings here for a length of time. As a matter of fact, the whole room is secure and it’s not uncommon to see a push bike or other large items safely stored in here. 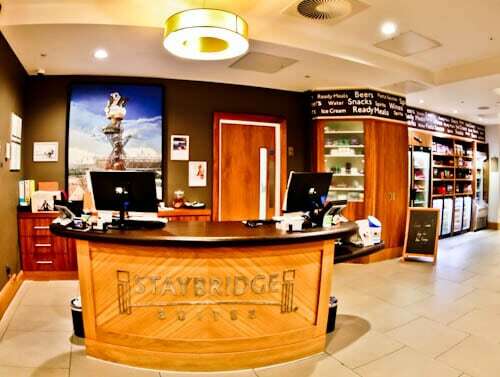 Enjoy your stay at Staybridge Suites Stratford City. It offers excellent facilities in an excellent London location. Where else in London are you adjacent to a shopping mall, a huge park and also within a few tube stops of the major sights of the city? 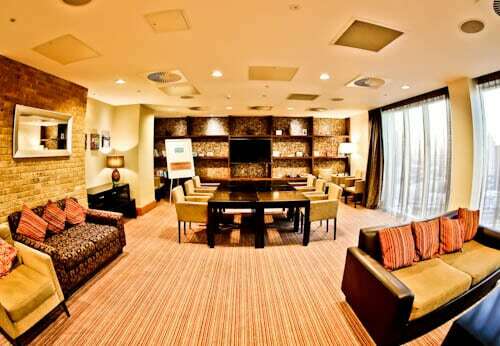 View the Staybridge Suites Manchester, Staybridge Suites Liverpool and Staybridge Suites Newcastle. Did you know there’s another property in London? 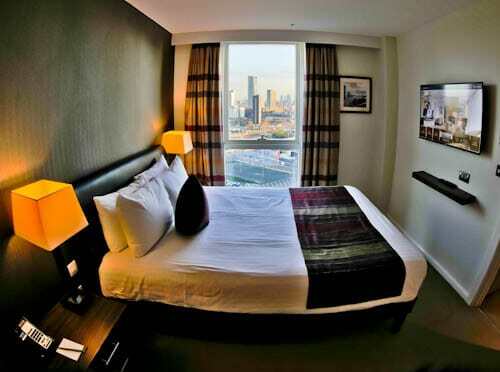 The Staybridge Suites Vauxhall.